The work of being a successful author doesn't end once we're published. Instead, it's only the beginning of the next step--marketing ourselves and our books. One of the recommended ways to do this is by creating a blog and updating it regularly. You can add blog articles on the writing process, the writing life, your books, etc. You can also entice readers by showing scenes from your books--or add to their enthusiasm by giving "cut" scenes space in your blog. But, what you really need to know is how to create a blog. Many thanks to Guest Columnist Scott Chow for explaining all the details we need. "Blog" is an abbreviated version of "weblog," which is a term used to describe websites that maintain an ongoing chronicle of information. A blog features diary-type commentary and links to articles on other websites, usually presented as a list of entries in reverse chronological order. Blogs range from the personal to the political, and can focus on one narrow subject or a whole range of subjects. Many blogs focus on a particular topic, such as web design, home staging, sports, or mobile technology. Some are more eclectic, presenting links to all types of other sites. And others are more like personal journals, presenting the author's daily life and thoughts. A main content area with articles listed chronologically, newest on top. Often, the articles are organized into categories. An archive of older articles. A way for people to leave comments about the articles. A list of links to other related sites, sometimes called a "blogroll". One or more "feeds" like RSS, Atom or RDF files. Some blogs may have additional features beyond these. Watch this short video for a simple explanation for what a blog is. Here are some professional bloggers' point of view on what is a blog. A blogger is a person who owns or runs a blog or a person who maintains the blog. That is, posting articles or new posts, information, sharing the most up-to-date news, opinions and case studies to name but a few. Such entries are known as blog posts. Content is the raison d'être for any website. Retail sites feature a catalog of products. University sites contain information about their campuses, curriculum, and faculty. News sites show the latest news stories. For a personal blog, you might have a bunch of observations, or reviews. Without some sort of updated content, there is little reason to visit a website more than once. On a blog, the content consists of articles (also sometimes called "posts" or "entries") that the author(s) writes. Yes, some blogs have multiple authors, each writing his/her own articles. Typically, blog authors compose their articles in a web-based interface, built into the blogging system itself. Some blogging systems also support the ability to use stand-alone "weblog client" software, which allows authors to write articles offline and upload them at a later time. Want an interactive website? Wouldn't it be nice if the readers of a website could leave comments, tips or impressions about the site or a specific article? With blogs, they can! Posting comments is one of the most exciting features of blogs. Most blogs have a method to allow visitors to leave comments. There are also nifty ways for authors of other blogs to leave comments without even visiting the blog! Called "pingbacks" or "trackbacks", they can inform other bloggers whenever they cite an article from another site in their own articles. All this ensures that online conversations can be maintained painlessly among various site users and websites. The Difference Between a Blog and CMS? Software that provides a method of managing your website is commonly called a CMS or "Content Management System". Many blogging software programs are considered a specific type of CMS. They provide the features required to create and maintain a blog, and can make publishing on the internet as simple as writing an article, giving it a title, and organizing it under (one or more) categories. While some CMS programs offer vast and sophisticated features, a basic blogging tool provides an interface where you can work in an easy and, to some degree, intuitive manner while it handles the logistics involved in making your composition presentable and publicly available. In other words, you get to focus on what you want to write, and the blogging tool takes care of the rest of the site management. WordPress is one such advanced blogging tool and it provides a rich set of features. Through its Administration Screen, you can set options for the behavior and presentation of your weblog. Via these Administration Screen, you can easily compose a blog post, push a button, and be published on the internet, instantly! WordPress goes to great pains to see that your blog posts look good, the text looks beautiful, and the html code it generates conforms to web standards. If you're just starting out, read Getting Started with WordPress, which contains information on how to get WordPress set up quickly and effectively, as well as information on performing basic tasks within WordPress, like creating new posts or editing existing ones. In addition to understanding how your specific blogging software works, such as WordPress, there are some terms and concepts you need to know. A blog is also a good way to keep track of articles on a site. A lot of blogs feature an archive based on dates (like a monthly or yearly archive). The front page of a blog may feature a calendar of dates linked to daily archives. Archives can also be based on categories featuring all the articles related to a specific category. It does not stop there; you can also archive your posts by author or alphabetically. The possibilities are endless. This ability to organize and present articles in a composed fashion is much of what makes blogging a popular personal publishing tool. A Feed is a function of special software that allows "Feedreaders" to access a site automatically looking for new content and then post updates about that new content to another site. This provides a way for users to keep up with the latest and hottest information posted on different blogging sites. Some Feeds include RSS (alternately defined as "Rich Site Summary" or "Really Simple Syndication"), Atom or RDF files. 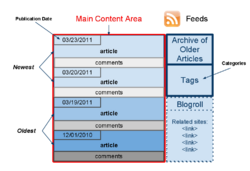 Dave Shea, author of the web design weblog Mezzoblue has written a comprehensive summary of feeds. A feed is a machine readable (usually XML) content publication that is updated regularly. Many weblogs publish a feed (usually RSS, but also possibly Atom and RDF and so on, as described above). There are tools out there that call themselves "feedreaders". What they do is they keep checking specified blogs to see if they have been updated, and when the blogs are updated, they display the new post, and a link to it, with an excerpt (or the whole contents) of the post. Each feed contains items that are published over time. When checking a feed, the feedreader is actually looking for new items. New items are automatically discovered and downloaded for you to read, so you don't have to visit all the blogs you are interested in. All you have to do with these feedreaders is to add the link to the RSS feed of all the blogs you are interested in. The feedreader will then inform you when any of the blogs have new posts in them. Most blogs have these "Syndication" feeds available for the readers to use. One of the most exciting features of blogging tools are the comments. This highly interactive feature allows users to comment upon article posts, link to your posts, and comment on and recommend them. These are known as trackbacks and pingbacks. We'll also discuss how to moderate and manage comments and how to deal with the annoying trend in "comment spam", when unwanted comments are posted to your blog. Person A writes something on their blog. The idea here is that more people are introduced to the conversation (both Person A's and Person B's readers can follow links to the other's post), and that there is a level of authenticity to the trackback comments because they originated from another weblog. Unfortunately, there is no actual verification performed on the incoming trackback, and indeed they can even be faked. Most trackbacks send to Person A only a small portion (called an "excerpt") of what Person B had to say. This is meant to act as a "teaser", letting Person A (and his readers) see some of what Person B had to say, and encouraging them all to click over to Person B's site to read the rest (and possibly comment). SixApart has published an official trackback specification. For example, Yvonne writes an interesting article on her Web log. Kathleen reads Yvonne's article and comments about it, linking back to Yvonne's original post. Using pingback, Kathleen's software can automatically notify Yvonne that her post has been linked to, and Yvonne's software can then include this information on her site. Person B posts on her own blog, linking to Person A's post. This automatically sends a pingback to Person A when both have pingback enabled blogs. Person A's blog receives the pingback, then automatically goes to Person B's post to confirm that the pingback did, in fact, originate there. The pingback is generally displayed on Person A's blog as simply a link to Person B's post. It is commonly believed that pingbacks do not send any content, as trackbacks do. This is not correct. If you get a pingback, you will see an excerpt from that blog in the Edit Comments section of your dashboard. The issue is that very few themes display these excerpts from pingbacks. The default Wordpress themes, for example, do not display pingback excerpts. In fact, there is only one significant difference between pingbacks and trackbacks: Pingbacks and trackbacks use drastically different communication technologies (XML-RPC and HTTP POST, respectively). But that difference is important because trackbacks have become the target of so much spam. The automatic verification process introduces a level of authenticity, making it harder to fake a pingback. Some feel that trackbacks are superior because readers of Person A's blog can at least see some of what Person B has to say, and then decide if they want to read more (and therefore click over to Person B's blog). Others feel that pingbacks are superior because they create a verifiable connection between posts. Comments on blogs are often criticized as lacking authority, since anyone can post anything using any name they like: there's no verification process to ensure that the person is who they claim to be. Trackbacks and Pingbacks both aim to provide some verification to blog commenting. Attempt to notify any blogs linked to from the article. Allow link notifications from other blogs (pingbacks and trackbacks) on new articles. Once enabled, trackbacks and pingbacks from other sites will appear in your Administration Screen just like other comments, but on your post pages, they will appear according to your theme's design. Once enabled, pingbacks are sent automatically when you publish your post, you don't have to do anything. To send trackbacks, you will need to find the trackback URL somewhere on the post page you are linking to. If you can't find one, try to determine if the site supports pingbacks. If it does, you should not send trackbacks as well. Copy/paste the trackback URL into the Send Trackbacks field on your Add New Post screen. If you don't see this field, go to the screen options and select the Send Trackbacks option. Note that selecting this does not send trackbacks, it only displays the field called Send Trackbacks. When you publish your post, trackbacks will be sent to the URLs you pasted into the field. This field will also show the status of trackbacks and pingbacks on your Edit Post screen. If there is someone that wants to send a trackback to your WordPress blog because their blogging software does not support pingbacks, your trackback URL they should insert into their post edit screen is your blog post's permalink with "trackback/" appended to the end. If their software supports pingbacks, they do not need to do anything, the process is automatic. Comment Moderation is a feature which allows the website owner and author to monitor and control the comments on the different article posts, and can help in tackling comment spam. It lets you moderate comments, & you can delete unwanted comments, approve cool comments and make other decisions about the comments. Comment Spam refers to useless comments (or trackbacks, or pingbacks) to posts on a blog. These are often irrelevant to the context value of the post. They can contain one or more links to other websites or domains. Spammers use Comment Spam as a medium to get higher page rank for their domains in Google, so that they can sell those domains at a higher price sometime in future or to obtain a high ranking in search results for an existing website. Spammers are relentless; because there can be substantial money involved, they work hard at their "job." They even build automated tools (robots) to rapidly submit their spam to the same or multiple weblogs. Many webloggers, especially beginners, sometimes feel overwhelmed by Comment Spam. There are solutions, though, to avoiding Comment Spam. WordPress includes many tools for combating Comment Spam. With a little up front effort, Comment Spam can be manageable, and certainly no reason to give up weblogging. Permalinks are the permanent URLs to your individual weblog posts, as well as categories and other lists of weblog postings. A permalink is what another weblogger will use to refer to your article (or section), or how you might send a link to your story in an e-mail message. Because others may link to your individual postings, the URL to that article shouldn't change. Permalinks are intended to be permanent (valid for a long time). How is a user to know what "p" represents? Where did the number 423 come from? One can easily guess that the Permalink includes the date of the posting, and the title, just by looking at the URL. One might also guess that hacking the URL to be /archives/2003/05/ would get a list of all the postings from May of 2003 (pretty cool). For more information on possible Permalink patterns in WordPress, see Using Permalinks. Some blogging tools offer the ability to email your posts directly to your blog, all without direct interaction through the blogging tool interface. WordPress offers this cool feature. Using email, you can now send in your post content to a pre-determined email address & voila! Your post is published! If you're using Pretty Permalinks, the Post Slug is the title of your article post within the link. The blogging tool software may simplify or truncate your title into a more appropriate form for using as a link. A title such as "I'll Make A Wish" might be truncated to "ill-make-a-wish". In WordPress, you can change the Post Slug to something else, like "make-a-wish", which sounds better than a wish made when sick. Excerpts are condensed summaries of your blog posts, with blogging tools being able to handle these in various ways. In WordPress, Excerpts can be specifically written to summarize the post, or generated automatically by using the first few paragraphs of a post or using the post up to a specific point, assigned by you. Plugins are cool bits of programming scripts that add additional functionality to your blog. These are often features which either enhance already available features or add them to your site. WordPress offers simple and easy ways of adding Plugins to your blog. From the Administration Screen, there is a Plugins Screen. You can easily search, install and activate Plugins from this Screen. Post regularly, but don't post if you have nothing worth posting about. Stick with only a few specific genres to talk about. Don't put 'subscribe' and 'vote me' links all over the front page until you have people that like your blog enough to ignore them (they're usually just in the way). Use a clean and simple theme if at all possible. Enjoy, blog for fun, comment on other peoples' blogs (as they normally visit back). Have fun blogging and remember, there are no rules to what you post on your blog! 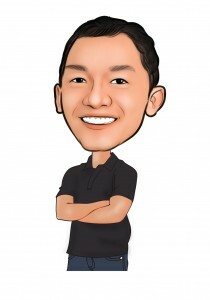 Scott Chow started blogging in the early 2000s and quickly discovered a passion for helping other bloggers share their voices with the world. Since that time he has helped thousands of bloggers get their start through his free step-by-step user guide (https://www.theblogstarter.com/step-1-get-started/), as well as his new video tutorial (https://www.youtube.com/watch?v=FDZ7xhArTr4).